The Packers tendered Allison a contract for the 2019 season Wednesday, Jason La Canfora of CBS Sports reports. Analysis: Allison was a restricted free agent who would have hit the open market had Green Bay not tendered him before the start of the new league year. Now locked in with the Packers for another season, Allison is a top candidate to enter the upcoming offseason program as the team's No. 2 wideout behind Davante Adams. Allison (groin) won't be eligible to be activated from injured reserve this season after the Packers designated wideout Jake Kumerow (shoulder) to return from IR on Wednesday, Tom Silverstein of the Milwaukee Journal Sentinel reports. Analysis: After bringing back fellow receiver Trevor Davis from IR last week, the Packers used their second and final designation on Kumerow, a preseason standout who seems to be near full health. While Allison projects to be close to 100 percent before the end of 2018, he was never an ideal candidate to return from IR since he wouldn't have been eligible to play until the postseason. Allison shouldn't face any restrictions when the Packers reconvene for OTAs next spring. The Packers placed Allison (groin) on injured reserve Tuesday. Allison is expected to undergo surgery on a core muscle injury, which will include a recovery timetable of six weeks, Ian Rapoport of NFL Network reports. Head coach Mike McCarthy indicated Monday that Allison (groin) is dealing with a significant injury and could be out for an extended period of time, Michael Cohen of The Athletic reports. Analysis: Rob Demovsky of ESPN relays that Allison may require surgery, but it isn't clear if the receiver is expected to miss the remainder of the season. In any case, rookie Marquez Valdes-Scantling figures to become an even more prominent figure in the Packers offense in the immediate future. Allison (groin/hamstring) was downgraded from doubtful to out for Sunday's game against the Patriots. Analysis: Allison has been marred by a concussion and hamstring issue over the last month and then the groin injury cropped up this week. Rookie Marquez Valdes-Scantling has shown a solid rapport with quarterback Aaron Rodgers in recent weeks and should take on a larger role against the Patriots with Allison again sidelined. The Packers will list Allison (groin/hamstring) as doubtful for Sunday's game against the Patriots, Mike Garafolo of NFL Network reports. Allison (hamstring) injured his groin at Thursday's practice, Rob Demovsky of ESPN.com reports. "We'll see where he is [Friday]," McCarthy said, when asked about Allison's status. Allison (hamstring) was limited in practice Wednesday, Michael Cohen of The Athletic reports. Allison caught one pass for 14 yards in Sunday's loss to the Rams. Allison (hamstring) doesn't have a designation on the final injury report for Sunday's game against the Rams, Michael Cohen of The Athletic reports. Analysis: Allison never quite made it back to full participation in practice, but the Packers nonetheless decided to remove him from the final injury report. Meanwhile, fellow wideout Randall Cobb (hamstring) is listed as questionable, despite logging a full practice Friday. Coming out of a bye, Aaron Rodgers likely will have his full group of pass-catching weapons for the first time since Week 3 against Washington. Marquez Valdes-Scantling figures to slide back to a minor role. Head coach Mike McCarthy said Thursday that he expects Allison (hamstring) to play in Sunday's game against the Rams. Allison (hamstring) was a limited practice participant Wednesday, Tom Silverstein of the Milwaukee Journal Sentinel reports. Analysis: Allison missed back-to-back games ahead of a Week 7 bye and apparently is still having some trouble with his hamstring. The long layoff should give him a decent chance to return, but it's still a situation that bears monitoring ahead of Sunday's road game against the Rams. A return to full participation Thursday or Friday would inspire confidence regarding Allison's Week 8 availability. Fellow wideouts Randall Cobb (hamstring) and Equanimeous St. Brown were also limited at Wednesday's session. 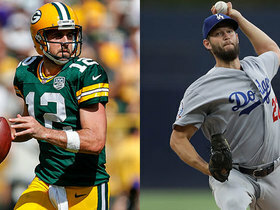 Allison (hamstring) is participating in Tuesday's practice, Ryan Wood of the Green Bay Press-Gazette reports. Allison (hamstring) is inactive for Monday's contest against the 49ers, Jason Wahlers of the Packers' official site reports. Analysis: With a Week 7 bye upcoming for the Packers, Allison and Randall Cobb won't play as a result of their respective hamstring injuries. For the second straight game, Aaron Rodgers will be working with Davante Adams and a trio of rookie wide receivers (Marquez Valdes-Scantling, Equanimeous St. Brown and J'Mon Moore). Allison (hamstring) will be listed among the Packers' inactives for Monday's game against the 49ers, Tom Pelissero of NFL.com reports. Allison (hamstring) likely will be inactive for Monday's game versus the 49ers, Adam Schefter of ESPN reports. 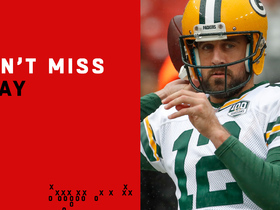 Analysis: The same applies to Randall Cobb (hamstring). With a bye Week 7, the Packers seemingly want to be healthy for the second half of the season, hence the reason caution is expected to be exercised. If both Allison and Cobb are absent, it sets up a similar receiving corps to a week ago, when Marquez Valdes-Scantling, Equanimeous St. Brown and J'Mon Moore joined No. 1 wideout Davante Adams as those available to Aaron Rodgers. The Packers have listed Allison (hamstring) as questionable for Monday's game against the 49ers, Michael Cohen of The Athletic reports. Analysis: Allison appears to be a true game-time decision going into Monday evening. He logged his third consecutive limited practice Saturday, which seems encouraging. Still, the timing of the game renders it a tricky situation for fantasy owners. With Randall Cobb (hamstring) also questionable, Marquez Valdes-Scantling and Equanimeous St. Brown could both be in line for another healthy workload. Allison was a limited participant in Friday's practice. Analysis: In addition to doing work with the rehab group, Allison and Randall Cobb (hamstring) both dressed in pads for at least a portion of Friday's practice, per Rob Demovsky of ESPN.com. It seems the injured wideouts could be headed for a game-time decision Monday against the 49ers. Marquez Valdes-Scantling and Equanimeous St. Brown will be the prime candidates for expanded roles if Allison and/or Cobb can't play. Head coach Mike McCarthy said Allison (hamstring) will work with the Packers' rehab group Friday, Michael Cohen of The Athletic reports. Analysis: Allison was expected to work with the rehab group Thursday but was still able to fit in a limited practice, so there is at least a chance he will get some work in Friday as well. His chances of playing Monday against the 49ers will get a boost if he is listed as either "limited" or "full" participation when the Packers release injury updates after Friday's practice. Updating a previous report, Allison (concussion) was a limited participant during Thursday's practice, Rob Demovsky of ESPN.com reports. Allison cleared the NFL's concussion protocol but will be withheld from Thursday's practice, Rob Demovsky of ESPN.com reports. Allison (concussion/hamstring) is listed as inactive Sunday at Detroit. Analysis: Since picking up a concussion last Sunday against the Bills, Allison has been absent from practice, making no noticeable progress through the NFL's protocol for head injuries. Until he makes an appearance on the field, it'll be difficult to peg when he'll next be available to the Packers offense, which also is down Randall Cobb (hamstring) at the moment. On a positive note, Davante Adams (calf) has been deemed active, so Aaron Rodgers won't have a completely inexperienced receiving corps Week 5. Allison (concussion/hamstring) is unlikely to play Sunday at Detroit, Stacey Dales of NFL Network reports. Allison (concussion/hamstring) is listed as questionable for Sunday's game against the Lions. Allison (concussion) still has hope of playing Sunday against the Lions, Michael Cohen of The Athletic reports. Allison (concussion) didn't practice Thursday, Tom Silverstein of the Milwaukee Journal Sentinel reports. Allison remains in the NFL's concussion protocol and isn't expected to practice Thursday, Rob Demovsky of ESPN.com reports. Allison (concussion) was a non-participant in Wednesday's practice, Michael Cohen of The Athletic reports. Coach Mike McCarthy said Wednesday that Allison remains in the NFL's concussion protocol, Rob Demovsky of ESPN.com reports. Allison suffered a concussion during Sunday's 22-0 win against the Bills, Jason Wilde of ESPN.com reports. Allison is potentially in line to see more looks from Aaron Rodgers on Sunday against the Bills, as Randall Cobb (hamstring) is officially listed as inactive for the contest. Allison could experience an uptick in targets Sunday against the Bills with Randall Cobb (hamstring) questionable for the contest, Rob Demovsky of ESPN.com reports. 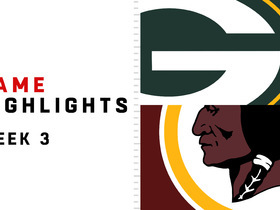 Allison brought in two of four targets for 76 yards and a touchdown in the Packers' 31-17 loss to the Redskins on Sunday. Allison caught six passes for 64 yards and blocked a punt in Sunday's tie with the Vikings. Analysis: Allison's per-reception numbers don't jump off the page, but he made a couple of key grabs Sunday, and his blocked punt -- which led directly to a touchdown -- in the first quarter gave him a big play for the second week in a row. Allison is generally considered the fourth option in the Packers' passing attack, but he has seen plenty of opportunities early on, averaging 51.5 snaps and seven targets per game through two weeks. Allison caught five passes for 69 yards and a touchdown in Sunday's victory over the Bears. Allison hauled in a 31-yard touchdown in Thursday's preseason finale against the Chiefs. Analysis: Allison ran a crisp stop-and-go route, and quarterback DeShone Kizer did not miss him while he was wide open in the end zone. 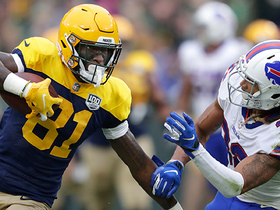 For fantasy purposes Allison is generally considered the Packers' third option at the wide receiver position, but fellow wideout Randall Cobb will often play out of the slot, so Allison could still see the field in some two-receiver sets. Allison caught two of three targets for 40 yards during Friday's preseason loss to the Raiders. Analysis: Allison was slotted into a starting role for the Packers with Davante Adams and Randall Cobb both sitting out along with the majority of the starting offense. Green Bay's offense struggled throughout the night, but Allison didn't do anything to lose his projected spot as the No. 3 receiver. Allison did not catch a pass in Thursday's preseason game against the Steelers. Analysis: Allison started the Packers' preseason opener with Randall Cobb out, but he was back in a reserve role Thursday with Cobb taking the field. Allison remains in position to open the season as the Packers' No. 3 receiver behind Cobb and Davante Adams. Allison caught two passes for 12 yards in Thursday's preseason contest. Analysis: Allison's numbers don't jump off the page by any means, but it's important to note that he was in the starting lineup when the game began. He is on track to open the season as the third option at the wide receiver position for the Packers behind Davante Adams and Randall Cobb (ankle). Allison opened training camp playing with the Packers' first-team offense, Michael Cohen of the Athletic reports. Allison is not participating in the Packers' mandatory minicamp Tuesday due to an ankle injury, Rob Demovsky of ESPN.com reports. Analysis: The exact severity of Allison's injury is currently unknown, but head coach Mike McCarthy did say Tuesday that the team is using minicamp to get a closer look at its younger, less-experienced players. Allison still probably fits into that category, but Green Bay has no reason to force him back out onto the field at this point in the offseason. Allison will have additional competition this offseason following the selection of three wide receivers in the 2018 NFL Draft, the Milwaukee Journal Sentinel reports. The Packers extended a tender to Allison, an exclusive rights free agent, on Wednesday, Rob Demovsky of ESPN.com reports. Analysis: After some maneuvering in the receiving corps the last 24 hours, the Packers made the easy decision to keep Allison in the fold. There's little question he won't fill the leadership void left behind by the release of Jordy Nelson, but Allison's usage should increase in three-wide formations alongside Davante Adams and Randall Cobb. As it stands, Allison seems destined to surpass his career-high marks of 23 catches (on 39 targets) for 253 yards from 2017. Allison caught two passes for 15 yards in the Packers' Week 17 loss to the Lions and finished the season with 23 receptions for 253 yards. Allison suffered a finger injury during Sunday's game in Detroit, Rob Demovsky of ESPN.com reports. Analysis: Listed as questionable to return, Allison hurt one of the fingers on his right hand. If his pass-catching is compromised enough, the Packers may hold him out of the remainder of the contest. With Davante Adams (concussion) and Jordy Nelson (shoulder) inactive, the wideout corps would be whittled down to Randall Cobb, Michael Clark, Trevor Davis and Jeff Janis. Allison (illness) is active Week 17 against the Lions. Allison (illness) returned to practice Friday as a limited participant and is listed as questionable for Sunday's game in Detroit, Rob Demovsky of ESPN.com reports. Allison was held out of practice Wednesday due to an illness, Michael Cohen of the Milwaukee Journal Sentinel reports. 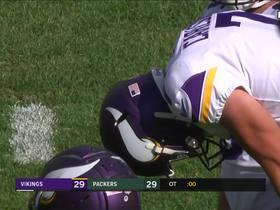 Allison caught one of three targets for nine yards in Saturday's 16-0 loss to the Vikings. Allison caught five passes for 33 yards and lost a fumble in Sunday's 31-24 loss to the Panthers. Allison caught four passes for 29 yards in Sunday's victory over the Browns. 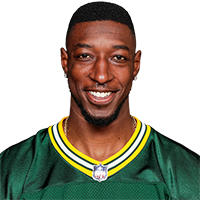 Analysis: Allison had caught just two total passes over nine games since a 122-yard effort in Week 3, but he got a chance to see the field more than usual Sunday with the Packers playing catch-up in the second half, and finished with his second most productive game of the season. Despite the increase in snaps Sunday, and the possible return of starting quarterback Aaron Rodgers (collarbone) in Week 15, Allison remains the Packers' No. 4 receiver and a dart throw for fantasy purposes. 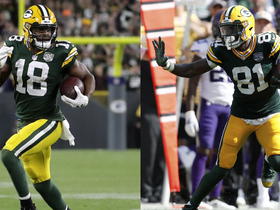 NFL Network's Tom Pelissero reports that Green Bay Packers wide receivers Randall Cobb and Geronimo Allison will not be playing in their Week 6 match up. 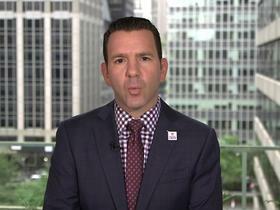 NFL Network Insider Ian Rapoport gives us an update on a handful of players' injury status such as Green Bay Packers wide receiver Davante Adams, and Detroit Lions wide receiver Marvin Jones Jr. going into Week 5 of NFL action. 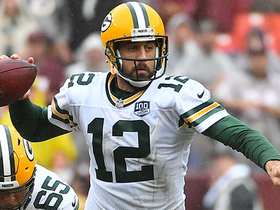 Green Bay Packers quarterback Aaron Rodgers finds wide receiver Geronimo Allison for 27 yards. 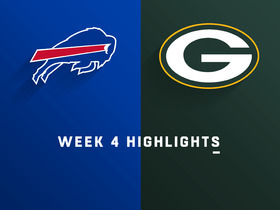 NFL Network's Adam Rank discusses why Green Bay Packers wide receiver Geronimo Allison will flourish this week vs. the Buffalo Bills thanks to the high ceiling abilities of quarterback Aron Rodgers. Green Bay Packers quarterback Aaron Rodgers finds wide receiver Geronimo Allison for a 12-yard gain. Green Bay Packers quarterback Aaron Rodgers finds wide open wide receiver Geronimo Allison for a deep 64-yard touchdown.